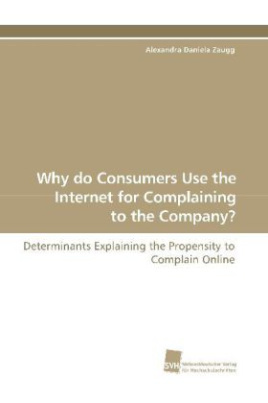 Why do Consumers Use the Internet for Complaining to the Company? Online complaining is said to be an efficient, convenient way of handling complaints for both customers and companies. Understanding why dissatisfied customers choose the Internet for complaining to the company supports practitioners in designing an effective online service recovery process as well as steering their customers' channel choice behaviour. Up to now, however, hardly any research has been conducted about online complaining. As a contribution to this field, the determinants of a customer's propensity to complain online are examined in this research project. Based on an extensive literature review and the findings of a comprehensive, tripartite qualitative study, a framework explaining why dissatisfied customers decide to complain online has been developed. In the expert interviews, the perspective of four customer care managers in the Swiss telecommunications industry and three scholars in the field of consumer complaining behaviour has been captured. The analysis of 126 complaints by letter and 135 online complaints adds unbiased data of complainants. Finally, seven interviews with online complainants provide insights into the customer perspective. Bitte schreiben Sie uns Ihre Meinung zu: Why do Consumers Use the Internet for Complaining to the Company?